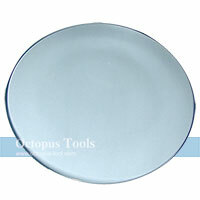 ◆ It can be attached to desk or table under thickness 43mm. 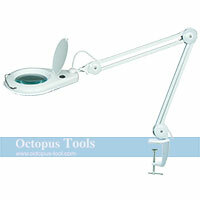 ◆ Adjustable arm makes working in limited space a lot easier. ◆ Arm is made by Aluminium alloys, strong and durable. 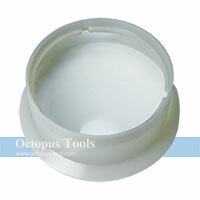 ◆ Ideal for assembly lines, workshops, or office applications. ◆ With knob, you can easily adjust the brigtness range from 10% to 100%. ◆ Using 14W energy-saving LED 5700K. Please feel free to discuss with us your Lighting and Magnifying plan, and choose the best solution for your requirements. ◆ The base is made by Zinc alloys. 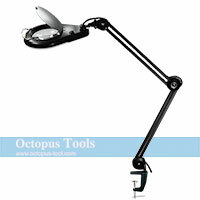 ◆ 100cm long arm and 5 inch 5-diopter glass magnifier lens make everything clear! ◆ Metal clamp securely holds to the surfaces up to 65mm. 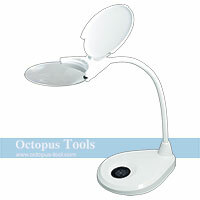 ◆ ABS lampshade and the flip-up cover protect the lens from dust. ◆ Adjustable neck makes working in limited space a lot easier. 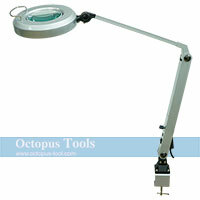 ◆ Lamp ideal for production or inspection line, and also suitable for reading, crafting, jewelry making. ◆ 22W circling fluorescent bulb provides glare-free light. 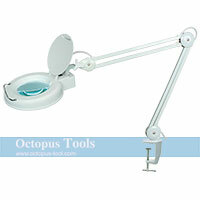 ◆ 100cm long arm and 5 inch 10-diopter glass magnifier lens make everything clear! ◆ Clamp holds firm to desk up to 65mm thick. ◆ Flash diffuser provides eye-pleasing experience. ◆ White energy-saving LED saves money on power consumption. ◆ White energy-saving LED provides eye-pleasing experience. 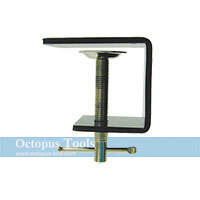 ◆ Clamp holds firm to desk up to 60mm thick. ◆ Triple-joint arm can be adjusted easily. ◆ With a flip-up cover protects the lens from dust and blocks the magnifying lens when not in use. ◆ ESD safe, suitable for electronic industry environment. ◆ With 4-level adjustable brightness, you can slide your finger on the sensitive switch to adjust brightness. 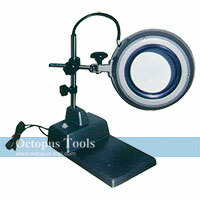 ◆ Great magnifier lamp for inspection, jewelry design, craftmen and hobbist.